Ayse Zamboglu joined Founders Space as a mentor. She is an angel investor, a member and one of the past Co-Chairs of the Device&Digital Screening Committee at Life Science Angels (#1 angel investment group in the US by CB Insights in 2014). Ayse has extensive medical device and pharmaceutical industry experience at start-ups, technology transfer offices and with multiple clients. She comes with a diverse product portfolio history and expat experience. Ayse advises and mentors start-ups in life sciences, healthcare and digital health. She is also interested in IoT and EdTech companies. Her focus areas are product development and management, fundraising strategies, and helping start-up companies refine their value proposition for the best product-market fit. She is passionate about empowering underprivileged young entrepreneurs and fostering the start-up ecosystem in Silicon Valley and believes that the know-how generated in this community should be shared with entrepreneurs worldwide. 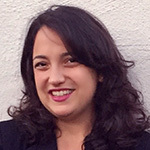 Having been based in San Francisco Bay Area for over 15 years, Ayse actively participates at demo days as a judge and serves as a speaker/panelist/moderator at industry events both in the US and abroad.